Halloween Bookmarks With and Without Vocabulary Words 5 Designs - One page contains bookmarks with Halloween words and one page has images only. The images only version gives the option of having students write the vocabulary words for a little extra practice. 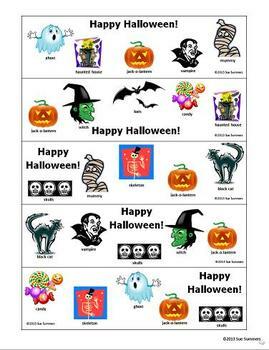 Each bookmark contains Happy Halloween and either 4 or 5 clip art images. Just copy, cut and share with your students! Halloween Bookmarks With and Without Vocabulary Words 5 Designs by Sue Summers is licensed under a Creative Commons Attribution-NonCommercial-NoDerivs 3.0 Unported License.